A Healthy lunch idea with the goodness of proteins, iron and vitamins. A vegan friend once asked me for a recipe for a wholesome meatless stew which prompted me to search my old recipe diary for vegan/ vegetarian recipes that can be made quickly and are wholesome too. 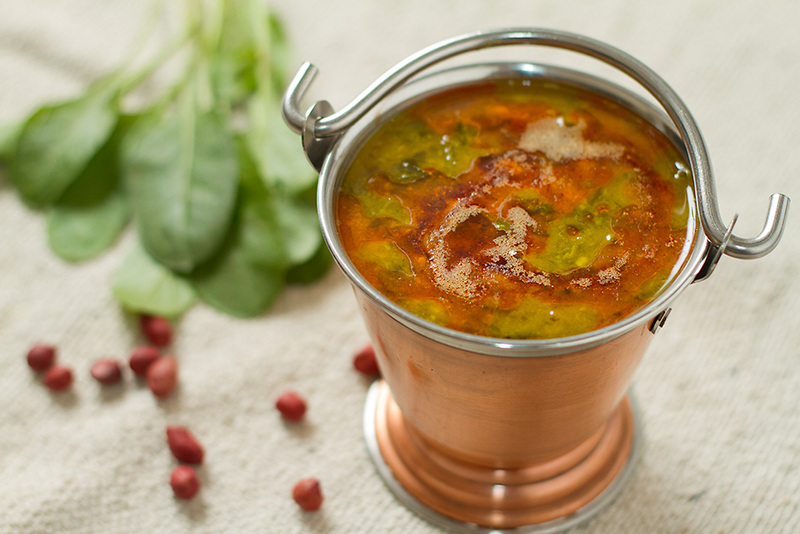 I was happy when I found this healthy vegan recipe of Spinach Lentil Stew with groundnuts, packed with goodness of proteins, iron and vitamins, we call it Palak wali dal and serve it with chapatis and fresh steamed rice. This recipe is very flexible, so while I have used split Bengal gram lentil, you can use any lentil or legume to make this dish. In Maharashtra there is a version which is called as Patal-bhaji. Toor dal, i.e. yellow pigeon peas, is available either plain or oily. It is called thuvaram paruppu in Tamil Nadu and is the main ingredient for the dish sambar. In Karnataka it is called togari bele and is an important ingredient in bisi bele bath. Toor Dal is called kandi pappu in Telugu and is used in the preparation of a staple dish pappu charu. It is also known as Arhar dal. Chana dal is produced by removing the outer layer of kala chana (black chickpeas) and then splitting the kernel. Although machines can do this, it can also be done at home by soaking the whole chickpeas and removing the loose skins by rubbing. Other varieties of chickpea may also be used, e.g. kabuli dal. Yellow split peas, while not commonly used on the Indian subcontinent, are very prevalent in the Indian communities of Fiji Islands, Guyana and Trinidad, and are popular amongst Indians in the United States. There, it is referred to generically as dal and is the most popular dal, although masoor dal and toor dal are also used. It is prepared similarly to dals found in India, but also may be used in a variety of other recipes. Mung dal or moong dal, split mung beans, is by far the most popular in Bangladesh. It is also used in parts of South India, such as in the Tamil dish ven pongal. Roasted and lightly salted or spiced moong dal is a popular snack in most parts of India. Urad dal, sometimes referred to as “black gram”, is the main ingredient of the Tamil Nadu (South Indian state) dishes idli and dosa. It is also one of the main ingredients of East Indian (oriya and Bengali or Assamese) bori, sun-dried dumplings. The Punjabi version is dal makhani. In Karnataka, it is called uddina bele. It is rich in protein. Rajma dal – split kidney beans. Various pulses may be split but not hulled; they are distinguished from hulled dal by adding the word chilka (skin). In a pressure pan boil split gram lentils (chana dal), cleaned and roughly chopped spinach leaves, tomatoes, ginger, groundnuts, turmeric powder and salt and cook for about 15 minutes on very low flame after the first whistle. Let the pressure drop on it's own, open the pressure pan, mix the cooked dal lightly and put it back on the stove. Add tamrind pulp and jaggery and allow the dal to boil for about 3-4 minutes and take the dal out in a serving bowl. In a small wok heat the ghee, add to it asafoetida, cumin seeds and red chile powder. Pour this mixture over the dal and serve hot with roti, chapati or steamed rice. In this recipe where did you use tomatoes. Thanks for stopping by. Tomatoes are added in the first step.